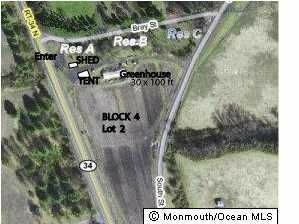 Great exposure on Route 34 and South Street, Unique property with 5.25 acres, Farm with Farm Stand, 3 Colts Neck Residences, plus studio with electric, UNLIMITED POSSIBILITIES. ADDITIONAL 2 ACRES ADJACENT ON THE SOUTH SIDE ARE AVAILABLE FOR LEASE. A1 ZONING. GREENHOUSE IS 30X100. EXCELLENT MULTI OPPORTUNITY!!! Courtesy of Janine D Del Tufo, Robert DeFalco Realty Inc.